I know you said you have boat insurance but is your boat really insured? 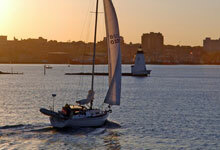 A lot of people have boat insurance, but don’t know how or what is insured. There is no state law requiring insurance on boats, so all coverage’s are voluntary. What, when, and how are things covered is very important. A lot of companies sell actual cash value policies that pay based on the value at the time of the loss not the insured value. For example, you have a 2001 Brand X boat that you bought new for $50,000 and you insured with XYZ Insurance for $50,000 since 2001 with an acv policy. Here we are in 2004 and the boat sinks and is deemed a total loss. The adjuster for the XYZ Insurance Company comes out with his blue book to determine the value of the boat and write you a check. The check will be for whatever the depreciated value is of that $50,000 2001 Brand X boat probably somewhere in the neighbor hood of $34,400 less your deductible. A far cry from the $50,000 you thought you were insured for. Agreed Value and Total Loss Replacement policies are available from some companies and avoid this unpleasant scenario. Check with your agent to find out what kind of policy you have. What if you are in the water fueling your boat and unbeknownst to you there is fuel leaking into the bilge? Once the level of your float switch is achieved it kicks on sending raw fuel into the intra-coastal waterway. The EPA wants to charge you with pollution and make you pay to clean up the spill. Does your boat insurance cover that? You, your spouse and the next-door neighbor’s kid Johnny are out in the river fishing. Another boat comes along and runs into your boat knocking little Johnny into the water and causing him injuries and $12,000 in hospital bills. Who pays for the damage to your boat and who pays Johnny’s hospital bills? Does your boat insurance cover that? Let’s try another one with the neighbor’s kid Johnny. This time you all are water skiing. Johnny is on skis being towed behind the boat when he slips and is hit in the head with the skis. A slight concussion and a few stitches later, the hospital bill is $5,000 but remember Johnny was not in the boat. Does your boat insurance cover Johnny? If you run out of gas, or the engine won’t start on your boat and you are 8 miles offshore, do you have coverage to bring you fuel or tow you back to shore? If you have a trailerable boat what about coverage when you are on the road. If you have a flat tire or break an axle or dead battery on the tow vehicle are you covered? What about coverage when you are trailering a boat. If you stop for gas with your boat on a trailer behind your car or truck and you back into another vehicle. Who pays to repair the other vehicle and who pays to repair the boat and trailer? How about those fishing rods and tackle box full of hooks and lures. If your boat sinks with them onboard or if they are stolen from the boat while you are not onboard, are they covered? Does it matter if they were in a locked compartment or just laying on the deck??? What deductible applies? Does your homeowners policy cover fishing equipment? What about dive gear? What about who can drive the boat? If you go fishing with your neighbor, is he insured if he drives the boat. What about if you let him use the boat without you? How about your son or daughter, who live out of state, can they use the boat while visiting Florida? Last but not least let’s talk about salvage & recovery. If your boat does sink will your policy pay to recover the boat and salvage anything of value??? If you are onboard your $100,000 boat and in the midst of going down and a rescue team salvages the boat and keeps it from becoming a total loss will your insurance company cover the $40,000 salvage and recovery bill?? The wisdom and experience of a knowledgeable agent is just a phone call or click away. Please complete the boat insurance quote request form at www.GoAtlassInsurance.com or call for a free quote and assistance from the professional group of agents at Atlass Insurance Group. Call toll free at 1-800-959-3313 or visit us online today. Comprehensive insurance products and services in all 50 States.